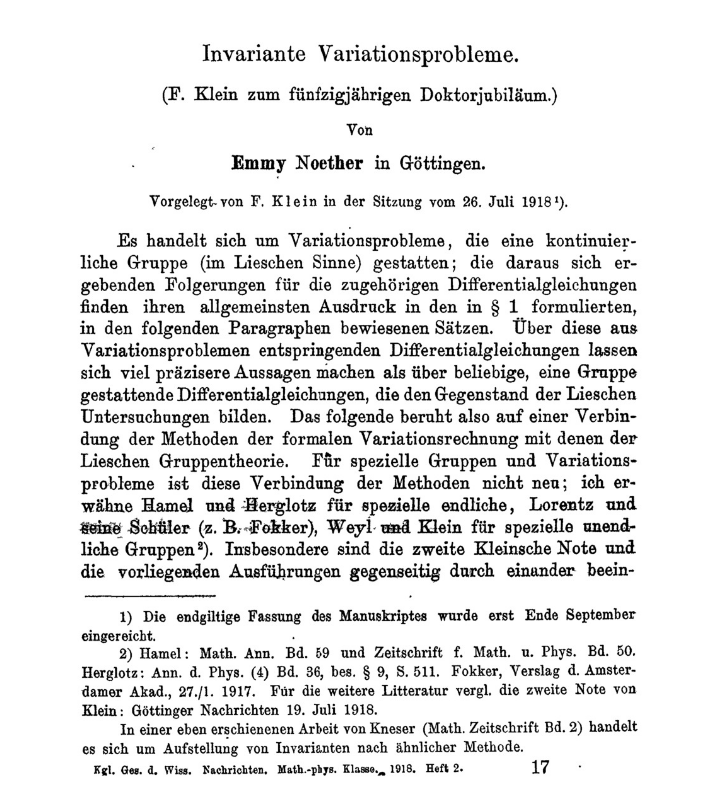 One hundred years ago today, the Scientific Society of Göttingen discussed a paper submitted by Amalie Emmy Noether, a German-Jewish mathematician. The paper demonstrated the relationship between symmetries in physics and conservation principles. Although she was recognized as a giant in her field—on her death in 1935, Albert Einstein wrote, “In the judgment of the most competent living mathematicians, Fräulein Noether was the most significant creative mathematical genius thus far produced”—she remains largely unknown today. 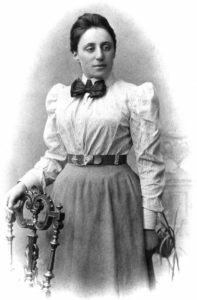 Although mathematicians still speak of “noetherian rings”, she deserves more recognition for prying open the door for women in science and mathematics. Emmy Noether would have been surprised to learn that she is remembered as a pioneer for educated women. She loved mathematics; it was her joy and passion, her poetry. Her father, Max Noether, was a famous mathematician and one of her brothers also became a mathematics professor. The early 20th century was a different era and, in Germany, a time of conformity for women. They were barred from enrolling in university classes, so without officially taking any classes, Noether received her doctorate in 1907. Despite not being allowed to register for classes, she was permitted to take the exams. Women were also prohibited from receiving compensation for academic teaching, so Noether lectured without a paycheck. Happy to think and talk mathematics, she accepted lecturing without an official title and lived in near-poverty. She may have considered it a privilege to teach in the university, breaking the gender barrier. 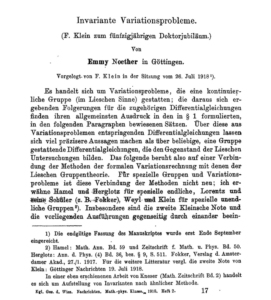 Noether, E.. “Invariante Variationsprobleme.” Nachrichten von der Gesellschaft der Wissenschaften zu Göttingen, Mathematisch-Physikalische Klasse 1918 (1918): 235-257. Universities were different then—the mathematics ‘department’ at Göttingen didn’t have such amenities as a building, an office, or even letterhead, so Noether and her students would continue classroom discussions over tea in her small apartment or on long walks. For Noether, math was fun—she wrote postcards to colleagues that contained mathematic problems. It was during this productive time that she published her great contribution to physics, now known as Noether’s theorem. World War I (1914-18) changed Europe radically as empires toppled and borders were redrawn. Women contributed so much to the war effort and recognition of their enlarged role in society surged after the war. In Germany women were given the right to vote in 1919, a year before the U.S. That same year, Noether became an ‘unofficial associate professor’, similar to an adjunct today. By 1923 she was finally receiving a modest stipend for her teaching. In the years that followed she lectured, directed doctoral dissertations, and published numerous papers. 1932 was to be the brightest year of her life: Noether was a co-recipient of the Akermann-Teubner mathematics award, which included an honorarium. She was recognized in many ways and because she had a warm, compassionate personality her colleagues and students threw a celebratory party for her 50th birthday. Outside the walls of the university political chaos was looming. A mere one year later, in 1933, Hitler came to power as Chancellor, and Noether, along with other Jewish faculty, was ousted from the university. Suddenly working in Germany was no longer possible for Noether, for her mathematician brother, and for other Jewish colleagues. Among the Jewish mathematicians who lost their livelihoods (along with anti-Nazis who quit) 85 of 145 fled to the United States, abruptly turning this country into the center of 20th century mathematics. Noether’s life was to intersect with Einstein’s again. At about the same time that Einstein left Germany for the newly formed Institute for Advanced Studies in Princeton, Noether obtained a one-year position at nearby Bryn Mawr. She enjoyed Bryn Mawr for its peace and serenity and was becoming accustomed to life in America. She was honored to give some lectures at the Institute in Princeton. With a grant from the Rockefeller Foundation, Noether’s contract at Bryn Mawr was renewed in 1934, which finally gave her peace of mind. Tragically, she never finished teaching that year. In 1935 she died, following surgery for a tumor. Emmy Noether was only 53. Thanks to the writings of her students, both in Germany and at Bryn Mawr, Noether’s brilliance has become better known. In the last decade there have been mathematics conferences and symposiums held in her honor in the U.S., Europe and Asia. There are scholarships and lectures in her name. There is a high school in Erlangen named for Noether. In Israel Bar-Ilan University established the Emmy Noether Institute for Mathematics. In Canada, the Emmy Noether Circle champions women in science. In perhaps the ultimate 21st century recognition Google celebrated the 133rd anniversary of her birth with a Google doodle in 2015. Noether was brilliant and resourceful and her story is remarkable. She left an enduring impact, through her own work and that of her ‘disciples’. It is a precious legacy for other women to follow.